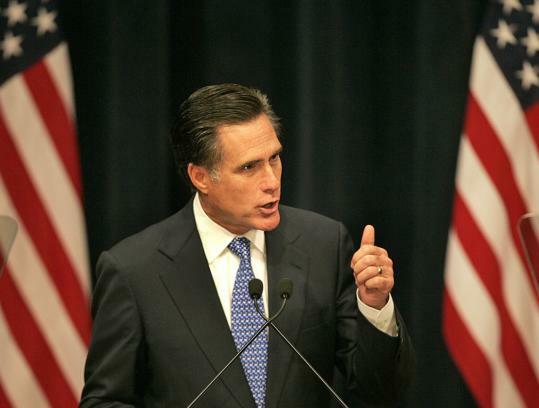 WASHINGTON — Mitt Romney and his strategists expected his Mormon faith to fade as an issue for fundamentalist Christians during his first presidential campaign. This time around, should he choose to run again, they have doubts. The idea during the 2008 campaign was that exposure to the candidate himself — a likable, teetotaling family man — would help convince people that there was nothing to fear in his beliefs. But even as the national Republican establishment warms to Romney as never before, the former candidate and his closest aides now believe a group of voters will always be off-limits because of his religion. That acknowledgment is just one part of a growing consensus within Romney’s circle that his 2008 campaign’s almost obsessive focus on winning over social conservatives was not only unsuited to his strengths as a candidate, but strategically misguided. If Romney decides to run, as many expect, the evolving view about his faith has serious implications for his strategy in the first caucus state of Iowa, where evangelical conservatives are particularly influential. The state would almost certainly play a less important role than it did last time, when the former Massachusetts governor counted on a first-place finish there to “slingshot’’ him into contention nationally. Romney’s advisers agree that the number of anti-Mormon voters in Iowa is probably small and none blame his second-place finish in the January 2008 caucuses directly on religious bigotry. Indeed, so many other things went wrong for Romney’s campaign — which was ultimately squeezed by former governor Mike Huckabee of Arkansas on the right and Senator John McCain of Arizona on the left — that pollsters have had trouble isolating a single cause for his loss. In Iowa, three-fifths of caucus-goers considered themselves “born-again or evangelical Christian,’’ according to a survey, taken for a media consortium as voters entered the caucuses. More than one-third of caucus-goers said a candidate’s religion matters a “great deal,’’ and Huckabee won more than 56 percent of their votes. Religious scholars have long debated the extent to which Mormonism is compatible with traditional Christian teachings. Mormons recognize Jesus Christ as their savior, but also believe that the Book of Mormon, first published in 1830, is a lost third testament to the Bible offering new revelation. As in the 2008 campaign, few Romney advisers would speak on the record about their approach on matters of faith, which they consider a media-driven distraction. “The issue of religion was dealt with extensively in the last campaign, and there is nothing I or anyone else could add to the subject that would represent something new,’’ spokesman Eric Fehrnstrom said. In early December 2007, after nearly a year as a presidential candidate in which he largely ignored questions of personal faith, Romney made his first extended remarks on the subject at the George Bush Presidential Library in Texas. The campaign hoped to evoke John F. Kennedy’s blunt speech to a group of Protestant ministers during the 1960 presidential race. The speech, delivered in nearby Houston, was credited with removing much of the mystery around the possibility of Kennedy becoming the first Catholic president. “I found that finally addressing it in a speech and drawing people’s attention to the fact that the nature of our country is one of religious pluralism was in my view a very effective way of bringing attention to this issue and settling it for the great majority of Americans,’’ said Romney. But Romney’s advisers also concede that a simultaneous effort to court social conservatives, particularly in Iowa, distracted him from core strengths thought to play better with moderates: his experience as a business leader and familiarity with economic issues. Even as he maintains a relatively high public profile, Romney is making no greater effort to explain his religious beliefs than he did during his campaign. In his best-selling book “No Apology,’’ published this spring, Romney mentioned his Mormon roots only in passing, and the two page section on “Belief and Purpose’’ strives for a common language that is secular and civic rather than theological. “Not all Americans believe in a Creator, yet in my experience, even most of those who don’t nevertheless believe in a purpose greater than ourselves — perhaps our family, our community, or the nation itself,’’ Romney wrote. A Romney adviser, who spoke anonymously to discuss an issue considered delicate, expected that the candidate’s religion was likely to come under less scrutiny in a second presidential run, with his Massachusetts political career as precedent. Romney’s Mormon faith was a major issue in his campaign for Senate in 1994 but faded by the time of his run for governor eight years later. “People felt that the issue had been dealt with ad nauseum in the last campaign,’’ the adviser said.